I am back with another DIY Update! This time it is my Spray Leave-In Conditioner. This goodness is a modified version of my previous Spray Leave-In Conditioner which you can read about here. 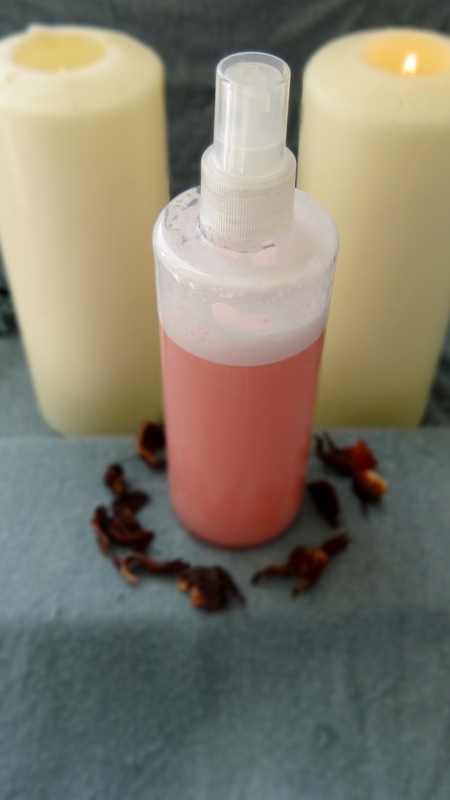 Similar to my updated Creamy Leave-In Conditioner I changed the recipe a little due to the fact that I no longer use the conditioner I use to use and the old mix was no longer as effective in moisturizing my hair as it use to be. This recipe is quite simple, does not include too many steps and like I mentioned is a slight modification from the old one. I sometimes add 0.8 oz fresh Aloe Vera Juice (from my garden) I didn’t this time. 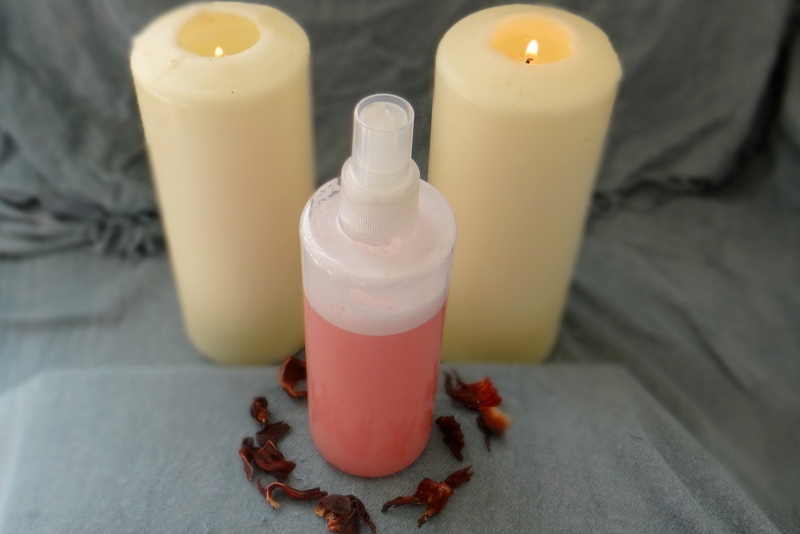 Essential Oil (any oil of choice) – I like the rose scent so I skip the essential oil. I first add the hibiscus petals to the water and let it sit while I add the other ingredients. In the mean time I pour the leave-in conditioner, rose water, almond oil, glycerine and vitamin E oil in my container. I then pour the hibiscus water through a sieve to catch the petals and then whisk. I pour the mix into a spray bottle and shake it before every use. This mix might be a little too light for those with coarser or thicker hair due to the fact that the ingredients I use are quite light weight. In case you do have thicker or coarser hair than I, you can either increase the amount of leave-in used, add a heavier carrier oil such as castor oil and/or double the amount of oil used in the mix. I like to use this mix when I want to lightly re-moisturize my hair or when I want to dampen my hair without getting it soaking wet before styling/restyling. The Leave-In is left out with the rest of my products (without needing to store it in the fridge). I have never had an issue with the mix going off or going rancid before I use it up, however, you can store it in the fridge just in case. Do you use a spray leave-in? Do you make your own or use a store bought one? I would love to hear from you. This entry was posted in DIY Spray Leave-In, moisturizing hair, Moisturizing Leave-In Conditioner, Spray Leave-In Conditioner and tagged diy leave-in conditioner for natural hair, DIY Moisturizing Natural curly Hair, DIY Moisturizing Natural Hair, DIY Spray Leave-In, Leave-In Conditioner, Moisturizing natural hair, natural hair, naturalista, Spray Leave In Conditioner, Spray Leave-in Conditioner on April 6, 2015 by Maicurls. Indeed love, so far so good thanks 😀 you are most welcome!! !